Mutations in mitochondrial DNA (mtDNA) are maternally inherited and can cause fatal or debilitating mitochondrial disorders. The severity of clinical symptoms is often associated with the level of mtDNA mutation load or degree of heteroplasmy. Current clinical options to prevent transmission of mtDNA mutations to offspring are limited. 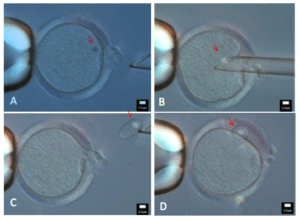 Experimental spindle transfer in metaphase II oocytes, also called mitochondrial replacement therapy, is a novel technology for preventing mtDNA transmission from oocytes to pre-implantation embryos. Here, we report a female carrier of Leigh syndrome (mtDNA mutation 8993T > G), with a long history of multiple undiagnosed pregnancy losses and deaths of offspring as a result of this disease, who underwent IVF after reconstitution of her oocytes by spindle transfer into the cytoplasm of enucleated donor oocytes. A male euploid blastocyst was obtained from the reconstituted oocytes, which had only a 5.7% mtDNA mutation load. Transfer of the embryo resulted in a pregnancy with delivery of a boy with neonatal mtDNA mutation load of 2.36–9.23% in his tested tissues. The boy is currently healthy at 7 months of age, although long-term follow-up of the child’s longitudinal development remains crucial. Spindle transfer from the patient’s metaphase II oocyte into the cytoplasm of a donor oocyte. (A) The patient’s oocyte immobilized by a holding pipette and approached by a transfer pipette; (B) suction of spindle into biopsy pipette; (C) spindle removed from the patient’s oocyte; (D) transfer of the removed spindle into the perivitelline space of the enucleated donor oocyte.